working out < stuffing face with all things delicious. AMIRITE? i’ve had a gym membership for a bajillion years that costs me 100 clams a month. so many glorious pairs of shoes i could be sporting right now, rather than not using my membership. i know you people are out there. i feel you. you feel me. we can be friends. well, i’m back. it’s been a while. i did a fitness challenge (yes, yes i did) over the winter with some co-workers through my gym, Healthworks. that was like ohhhhh 9 months ago. i’ve since learned that post-30 you lose your shape VERY RAPIDLY. i was running and doing push-ups people. PUSH-UPS. the real ones. not the girl ones. now i don’t even know what a push-up is. push-pop? i figured my chips and salsa dinners weren’t the best idea for fueling, so i made a slow-cooker dish that i frequent because it’s so easy and versatile. freezable too. serve it over brown rice, greens, tacos, or on its own. great source of protein and PLEASE, feel free add cheese/guacamole/hot sauce/WHATEVS. 1. COMBINE chicken broth, beans, corn, tomatoes, cilantro, scallions, garlic powder, onion powder, cumin, cayenne pepper and salt in the crock pot. Season chicken breast with salt and lay on top. 2. COOK on low for 10 hours or on high for 6 hours. Half hour before serving, remove chicken and shred. Return chicken to slow cooker and stir in. Adjust salt and seasoning to taste. 3. EAT it up (maybe) after you get back from the gym. i’m headed to cardio kickboxing. i’m so uncoordinated that i’m afraid i might actually punch someone out. 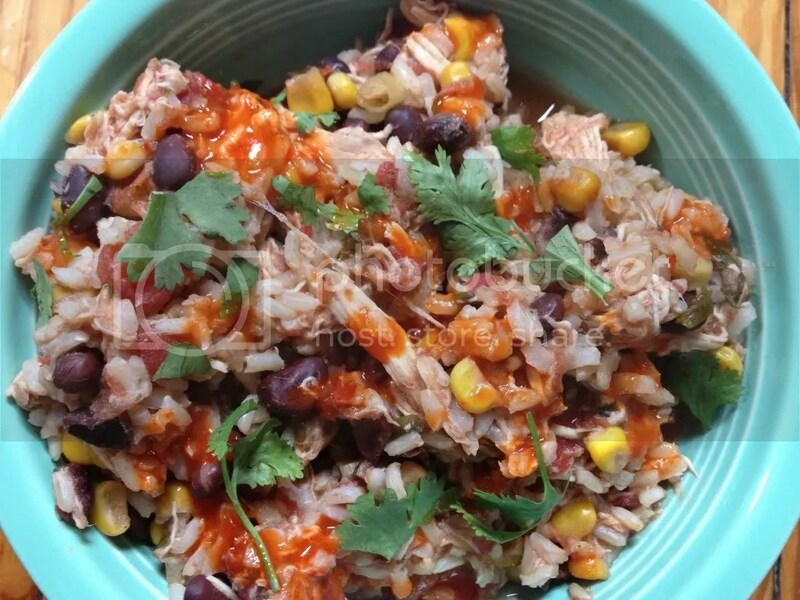 This entry was posted in recipe, slow cooker and tagged chicken, crock pot, gym, push up, slow cooker. Bookmark the permalink. LOOKS AND SOUNDS TERRIFIC, ERIN! GONNA TRY IT SOOOOONNN! !